My research involves the modeling of evolution on computers. In particular, I am interested in evolution over macroevolutionary timescales (many generations). For example, the various breeds of modern dogs arose from ancestors of the grey wolf. 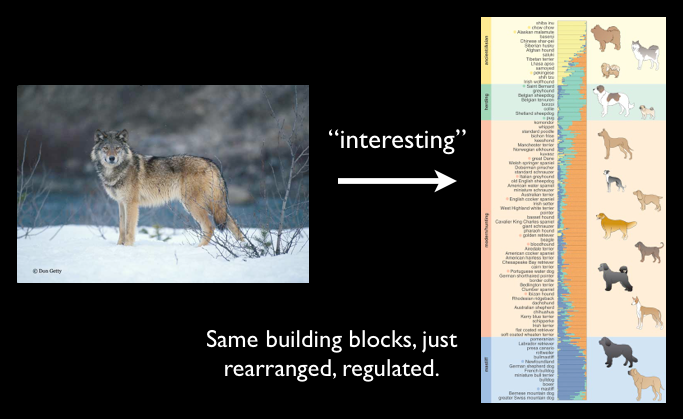 Dogs contain most of the same genes as wolves, but they have been regulated differently to produce a wide variety of morphologies and behaviors. I would count this as microevolution - a few thousand generations. It's pretty interesting that evolution can do this. The traditional methods of developing scientific knowledge about evolution have been: 1) observation of nature and the fossil record, and 2) experiments with biological organisms. In the 20th century, a third method arose: mathematical population genetics. These three methods complement each other, but they also have shortcomings. Although in vivo experimentation permits direct testing of evolutionary hypotheses, it is limited to small numbers of generations (due to the long generation times of model organisms, and the short lifespans of human experimenters), and many things are difficult to measure in vivo. In contrast, fossil evidence and mathematical methods can provide insight into macroevolution. However, the fossil record only sparsely samples organisms in time and space, and shows us the morphology of ancient creatures, but loses many other details (behavior, soft tissues, DNA, etc. ); and mathematical methods must treat simplified models. In the past few decades, a fourth "way of knowing" about evolution has matured: genomic studies permit detailed comparisons of the descendants of different ancient lineages, reaching back in time with a level of detail that fossil data cannot provide. However, none of these methods permit direct experimentation on macroevolutionary timescales. We cannot change any parameter we like; we can only observe what has already occurred. Thus I suggest that in silico experimental evolution provides a fifth "way of knowing" about evolution that complements the other methods. In particular, computer simulations let us perform experiments on macroevolutionary timescales - where the "magic" happens. Using computer models, we can test evolutionary hypotheses that are difficult or impossible to test with in vivo experiments (because generation times are too long, or because certain measurements are too difficult). Computer evolution and biological evolution are two subdomains of a broader concept: the evolutionary process in general. In this sense, computer evolution is "real" evolution, even though there is not a close biological counterpart to every computer-evolutionary model, or vice versa. Thus in silico experiments allow us to explore evolution, both as it is in biology, and as it could be in general. In silico evolution has three main uses. I am interested in all three of them. We may test hypotheses about biology or natural history with computer models that are designed to closely approximate biology. If we are primarily concerned with applicability to biology, we must subsequently verify our conclusions with biological experiments or observations, but this job is made much easier when we are guided by the results of computer experiments. We may directly demonstrate principles and test hypotheses about general evolution (in the broad sense, including both biological and computer evolution). Natural history only provides us with a single example of how complexity evolved. 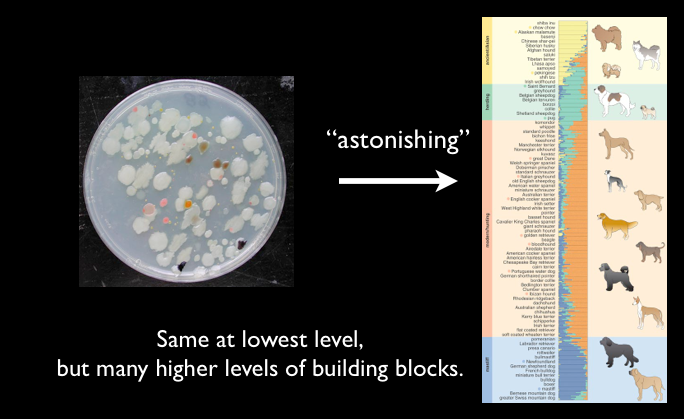 In silico experiments let us explore how complexity could have evolved, in addition to how it did evolve, historically. If we can learn how evolution produces complexity, and how to encourage this process, we may ultimately be able to automatically produce complex artifacts with in silico evolution that would be difficult to design manually. I spend half of my time on theoretical biology. I study the evolution of “evolvability”. This can be summarized by the question “How does evolution ‘scale up’ to produce very complex artifacts?” In this part of my work, I try to understand both how the evolution of evolvability occurred in natural history, and how it could occur in general. I spend the other half of my time on applied artificial evolution. The eventual goal is to evolve very complex artifacts that are too difficult to program or design manually. For the past several years, I have been working on the evolution of neural networks for robotic control, with the goal of evolving increasingly complex behaviors. In this part of my work, I seek to harness the evolution of evolvability to practical ends; this requires understanding how to create an evolving system that permits the accretion of layers of complexity, and then how to encourage this process. Here are some of the projects I have been working on recently. But is computer evolution real evolution? Some biologists don't believe that computer evolution is "real" evolution. I think this has to do with a gut feeling that computer evolution can never produce artifacts that rival the complexity of living things. If real complexity couldn't ever arise in computer evolution, then you couldn't study the real "magic" of evolution - how it makes truly complex artifacts. However, I think this gut feeling is wrong. I would claim that in principle, there is no reason that artifacts evolved on a computer cannot become arbitrarily complex. To say that computer-evolved artifacts cannot in principle become as complex as living things would seem to ascribe magical, non-physical properties to living matter, which I don't think these scientists intend to do. However, even if one agrees that, in principle, very complex artifacts could be evolved on a computer, one could still doubt whether it will ever happen in practice. Clearly, it took about 3 billion years, with unknown numbers of organisms struggling and reproducing, throughout vast oceans and continents, to ultimately produce complex animals. It will essentially be never (argues the skeptic) that one can duplicate this on a computer. But we do not have to duplicate natural history in every detail to begin to ask the most interesting questions: What dictates the rate of the evolution of complexity? (Why did it take 3 billion years to get here? With some good luck, could it have happened in 300 million? Why not 30 billion?) Did it really need all those organisms, or is Nature just not very efficient? What if the earth were 10x its radius (100x the surface area), would it then have taken 100x less time? What if mass extinctions (from asteroid strikes, etc.) had been 10x as frequent? These are some of the most fundamental questions of evolutionary biology, but the basic parameters dictating the rate of evolution of complexity are not understood at all, which is rather shocking! Another open problem: "biological complexity" has no agreed quantitative definition. An understanding of these principles will complete the foundations of evolutionary biology, and in silico experimentation is well suited to illuminate them. These principles may also show us how to speed up the evolution of useful, very complex, artifacts in silico. We would like to evolve moderately complex artifacts on a human-affordable (or at least institution-affordable) computer, in much less than a human lifetime. It doesn't really count as success to use a computer as big as the Earth and take another 3 billion years to run your "program"! Clearly, no computer-evolved artifact is yet as complex as a living cell, but I believe that this is due to our lack of understanding of how to encourage the evolution of complexity, and a lack of sufficient computer power being applied to the problem. I think it's only a matter of time before we figure out the important principles, and until we apply enough computing power (think on the physical scale of datacenters, and note that every 30 years, computers become 2^(30/1.5)=1,000,000-fold as powerful per dollar) to evolve some very complex artifacts in silico, with no limit to the complexity in principle.